We don't all claim to be linguists or experts on Japanese language or culture here at Nintendo Life, but being the dedicated journalists that we are, we're always willing to do a bit of research. It turns out that origami, the art of paper folding, has a very interesting linguistic background. When broken down, "ori" means to fold or change something while "kami" is the name given to the type of paper used in this craft. Brought together, the two syllables form the word "origami," and we promise that this is all somehow relevant to video game reviews. 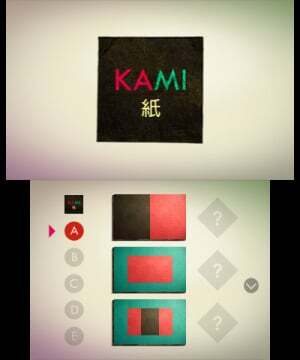 Beginning life as a mobile game, CIRCLE Entertainment has brought State of Play's absolutely gorgeous paper-based puzzler KAMI to the 3DS eShop. Though the aesthetic may be reflective of paper (kami), this game is actually much more about the "ori" aspect of the ancient craft. Making use of calming visuals and a soundtrack to match, this title sets out to create a Zen experience about change, and it achieves this goal quite well. Jumping right in, one of the more noticeable aspects of KAMI is that the whole game isn't very noticeable at all. The menus are minimal and the tutorials are mostly non-existent in an attempt to keep up with the premise of providing soothingly simplistic puzzles – it's an intentionally underwhelming experience that revels in its own simplicity. This game aims for Zen and it achieves this before the gameplay begins. 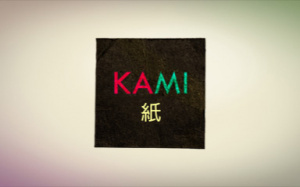 Even if this isn't the type of game that appeals to you, it's obvious that much care was placed into crafting KAMI into a standout experience. The gameplay is unique, but it's not entirely different from recent 3DS and Wii U double feature Color Zen, another puzzler that aims to relax its players while challenging them to think outside of the box. 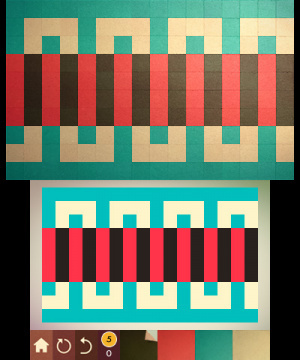 Displaying the same flat image on both the 3DS's top and bottom screens, your goal is to alter the image to appear as one solid colour in as few moves as possible. The colours available at your disposal are displayed on the touchscreen, selected, and deployed with a simple tap. When a colour is spread across the screen, it will effectively consume the selected area while overtaking matching colours around it. It may seem a bit complex on paper, but the concept is actually very straightforward once you're got your hands on it. 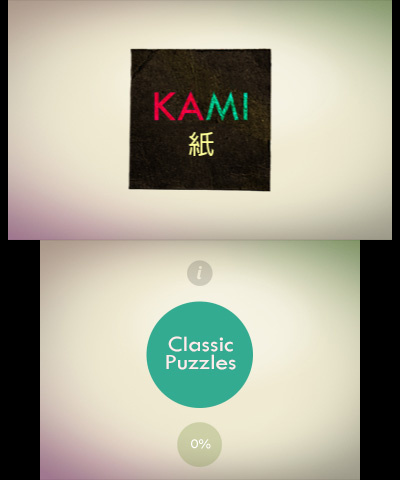 There are five groups of challenges labelled Classic Puzzles to complete, each with nine unique puzzles within. After completing these initial 45 puzzles a group of Extra Puzzles is unlocked, providing further challenge with more difficult tasks. The puzzles become significantly more difficult as you progress, but the real challenge and replayability stems from the desire to complete each in as few moves as possible. Easily the biggest letdown here is that the 3DS's upper display is not used to its fullest potential. This is the screen on which the actual paper folding animation appears, but because the inputs occur exclusively on the bottom screen you will rarely have a reason or opportunity to look up. The console's 3D display is also completely ignored, but that's a more understandable exclusion as the style mostly employs the flatness of paper to create its aesthetic. It's disappointing that the folding animation couldn't be implemented on the actual interactive portion, but when all is said and done it's a minor complaint about an otherwise charming experience. If you're looking for a relaxing puzzler to help unwind at the end of the day, KAMI may be just right for you. Coupling simplistic gameplay with an attractive aesthetic that aims for Zen, this is the rare type of game that achieves a whole lot with very little. 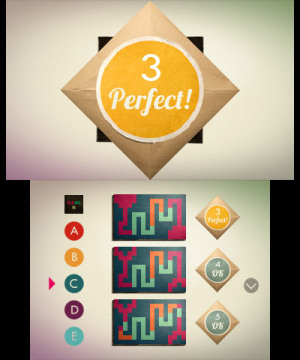 It's not a perfect game, and the difficulty in later stages may deter some of the more casual puzzle fans out there, but it's worth keeping in mind that this was designed as a way to relax, and is best experienced when taken lightly. @Ron_DelVillano But I'm still here. Btw! Fair review, wanted to give this a try. @MysteriousBebsi Thanks! It's a cool little puzzler, if you're into that sort of thing. @MysteriousBebsi Do you really believe your own hype that much? @Samuel-Flutter I AM THE hype!! Hehe, I just finished watching that episode. It also has some puzzles which were in the Steam release, but weren't available in the Android version. I'd probably get it if it were to come to Europe one day. May get this as I got Color Zen. It also reminds me of Kat and Ana's minigame on Game & Wario. I actually played this on mobile like a year ago. It's an okay game, nice puzzles I guess. I wouldn't say it's gorgeous though, not at all. You missed out on the subtitle being "He Me HA!" The review reads more like an 8-9 to me Looks really nice though. Does anyone have any comment on the amount of content in the game?